On Monday 15th April between 4.30-6.00pm at Bristol Civil and Family Justice Centre, there will be a debate on the proposal : ‘We make unnecessary use of care proceedings’. The debate will be held at Bristol Civil & Family Justice Centre. Booking is essential, and you can reserve your place here. NB THIS EVENT HAS BEEN POSTPONED TO A DATE TO BE FIXED IN APRIL 2019. WATCH THIS SPACE. On Weds 6 Feb at 4.30-6.pm there will be a debate on the question : ‘We make unnecessary use of care proceedings’. The debate will be held at Bristol Civil & Family Justice Centre. Further details will be posted here in due course. Meanwhile, please save the date. Booking will be required so please check back. Both events are free but booking is essential. If you wish to attend either event please e-mail the Family Delivery Manager- Jerry Fowler : jerry.fowler@justice.gov.uk. 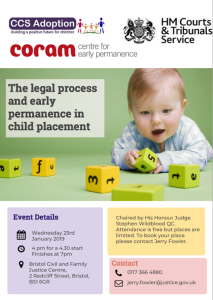 This event is hosted by the London Courts in partnership with CCS Adoption and Coram Centre for Early Permanence and supported by DfE funding. It will be chaired by His Honour Judge Stephen Wildblood QC. The aim is to consider the role of the courts in decision making and hear from the experience of carers and recent research into early permanence. The seminar offers topical exchange in the current policy context with and between leaders in the field, focussing on fostering for adoption and concurrent planning, the journey of carers, rights and duties towards birth families, contact, and clarity as to the legal process. It is underpinned by the new Practice Guidance The role of Fostering for Adoption in achieving early permanence for children and the recent update of longitudinal research into impact of concurrency planning. Journalist Louise Tickle will be giving a lecture on “How Information Technology and Modern Communication Systems Are Affecting Journalism and Family Law”. 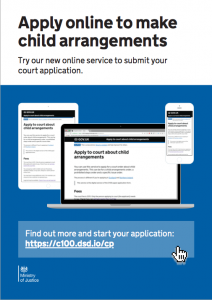 There is a new pilot allowing parents without a solicitor to issue an application about children online rather than on paper. In this area, it is only available for those who would be issuing in the Family Court at Bristol. Visit the online application site here. It has proved necessary to alter the arrangements for the theatre event on 11 January and the conference on 1 February 2018. The theatre event at St Brendan’s College will now not take place on 11th January 2018. It has been necessary to put it back to 6.30 p.m. on 1st February. It will still take place at St Brendan’s College and tickets that have been bought for the 11th January are valid for that date. There is free parking there. The play, which shows a family that becomes involved in care proceedings, will end by 8.00 p.m. There will be pauses in the play when the audience can ask the actors (including me – I play the judge) questions about the roles that they are playing. The conference on 1st February 2018 will now start at 4.00 p.m. and will finish by 5.15 p.m. (in order that those who wish to do so can attend the theatre event at St Brendan’s). Are you involved in a court case or thinking about starting one? Students from the universities in Bristol are holding information sessions where they will explain about the court procedure, what you can expect in court and what you need to do in preparation for the court hearing. You will be also given a tour of the court. We are delighted to announce that Radio 5 will be joining us and recording the session on Thursday 1 February 2018. Book your place now (there is no obligation to speak to them)! 01483 216 571 and ask about LiP Service or you can book via our Facebook page. 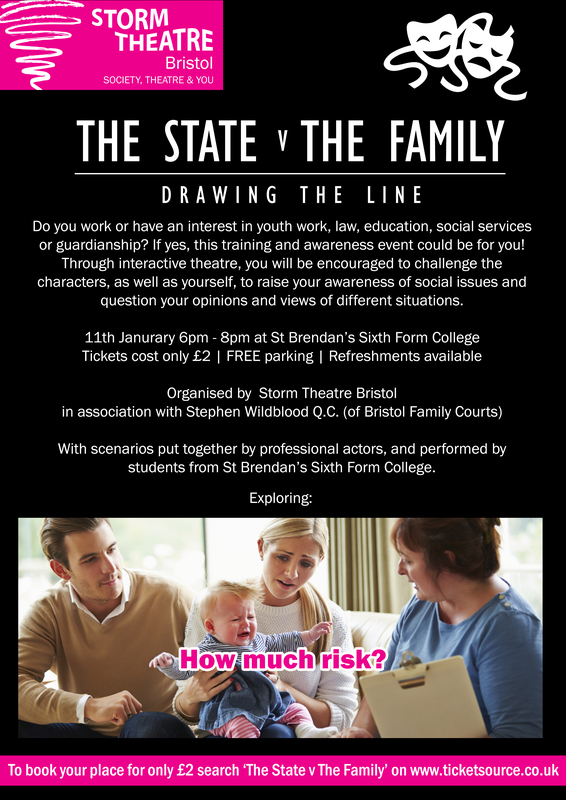 On 1st February 2018 at between 4.30 p.m. and 6.00 p.m. there will be a conference in Court 7 of The Civil and Family Justice Centre, 2 Redcliff Street, Bristol, BS1 6GR which will explain some of the initiatives in place in the Bristol Family Court and take your suggestions about how things might be done better. Admission to the conference is free and the public, including the press, are specifically invited. The conference will be chaired by His Honour Judge Stephen Wildblood QC. RSVP to Jerry Fowler : jerry.fowler@hmcts.gsi.gov.uk. NB An earlier version of this post said no RSVP was required – it is! 11 January : Interactive theatre production : How much risk should there be before the state intervenes? NB THIS EVENT HAS BEEN POSTPONED to 1 FEB. The expected date for the reopening of the Civil and Family Justice Centre in Redcliffe Street has been put back until mid November. See Letter to court users September 2017 for details of temporary arrangements.